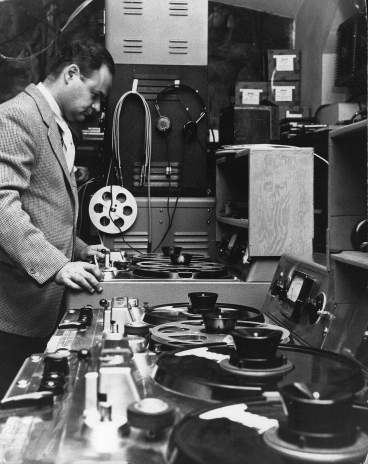 All performance characteristics of the Ampex Model 300 Magnetic Tape Recorder equal or exceed the standards of the NARTB (National Association of Radio & Television Broadcasters). All Ampex audio recorders reproduce a tape frequency characteristic which has been accepted as standard by the NARTB. 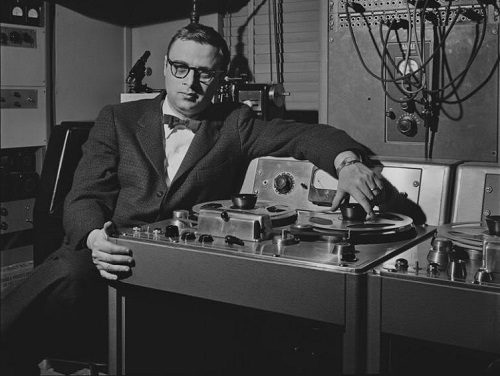 For the Ampex Model 300, Harold Lindsay designed the mechanical part and Frank Lennert designed all of the electronicsincluding the record/playback electronics. It used 10.5 inch reels, 1/4-inch tape facing inward, and was a two-speed machine switchable to either 7.5 or 15 ips. Harold designed a new head that, when compared to the one for the 200A, was less expensive, performed better and was more uniform from head to head. The new head made tapes more easily interchangeable from machine to machine than was possible between 200A recorders. The first production Model 300 was shipped in late spring, 1949. A 15/30 ips version, the Model 301, was introduced shortly after that. The 300 transport became the platform for many versions of both audio and instrumentation recorders. Overall about 20,000 of these transports were produced. 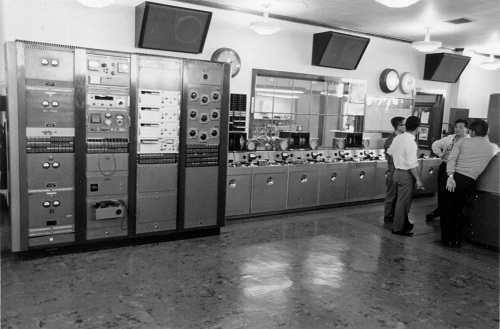 - AMPEX Model 300 Tape Machines - Voice of America, Okinawa relay station, Control Room in operation until ~1977. circa March 1968. Tapes were not interchangeable between the 200A and the 301 due to several factors. First, the tape on the 200A had the oxide facing outward, whereas on the 301 it faced inward. Second, the record equalization was different, and the 301 was designed to use 3M 111 (again, the 200A used the 3M RR/112 tape). It became embarrassing that the Model 301 had better frequency response, lower noise, and lower flutter than the 200A. Sales of the Models 300 and 301 quickly outstripped those of the 200A, which was soon phased out; in the end, a total of 112 Model 200A recorders were manufactured and shipped. Foundational text courtesy of Ross H. Snyder and John Leslie from the AES Historical Committee paper, “History of The Early Days of Ampex Corporation”. - Ampex Model 300 Mono Deck shown at Mira Sound Studio's, NY. Photo courtesy of George Schowerer. Dave Sarser checking out one of the three Ampex 300 Consoles he installed in the Toscanini Studio in the basement of Villa Pauline in Riverdale. Photo and text courtesy of Jim Reeves. 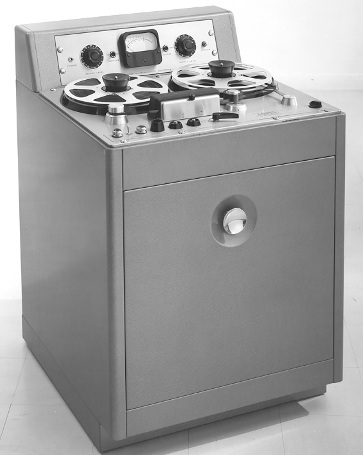 - Ampex 300-3 - Photo Courtesy of Wikimedia Commons. AMPEX Model 300, mono 1/4", Tape Machine. Photo courtesy of the Audio Engineering Society (AES) Historical Committee. Do you have content, to add, about the Ampex Model 300 Tape Machine or associated topics? Please feel free to Share it, here!